Mumbai: Dr Neeraj Hatekar, a professor in the Economics Department at the University of Mumbai, was recently suspended by the University allegedly for criticising the Vice Chancellor. 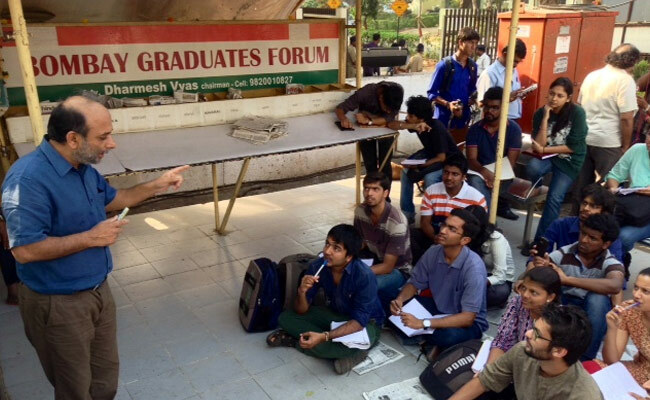 On Tuesday, he took his classes on the road outside the campus gates. Dr Hatekar has petitioned the Bombay High Court against his suspension. We had barely sat down to dinner on Tuesday when my PhD student Savita walked in. She seemed a little, just a little, excited. The function, held at the Mumbai University campus at Kalina, was attended by four ministers of the Maharashtra government and the incident happened when the Vice Chancellor stood up to speak. At the dinner table, this took some time to sink in. My wife quietly packed away the dinner, as no one wanted to eat any more. What would happen to the students? Had they been arrested? Would the police beat them up? Narayan and Amol are sons of small farmers from the dryland tracts of interior Maharashtra. I had watched closely as they struggled to pay fees and mess bills when a massive drought struck their homes last year. The hostel mess had been closed for two months then, pending an administrative decision. Some students had gone back to their home towns because they could no longer afford to eat at hotels and restaurants. Some others resorted to eating only once a day. Later, university officials met them amid strict police security and promised to solve all their problems. This was a year ago. The mess has been re-started but other problems remain unsolved. Indeed, many state universities in Maharashtra, like the Mumbai University, are in a mess of a serious kind. My confrontation with the administration of the Mumbai University has helped me see what the real problem is. The universities are supposed to be autonomous organisations, run by the various authorities like the management council, senate, academic council, research recognition committees, with the purpose of creating and disseminating quality knowledge. Unfortunately, the various committees often function for the private interests of the powerful lobbies that run them. The Vice Chancellors are supposed to keep these strongmen in check, but they lack the stature to be able to exercise necessary control. Many times they obtain their positions through small-time politicians and then survive on their skills of managing the various factions. Academic objectives fall by the way side. At the Mumbai University, the appointment of the Vice Chancellor has been mired in controversy since the day he joined. His CV said that he had 25 years of teaching experience and 12 research papers. In a subsequent affidavit submitted to the Bombay High Court, he changed it to five research publications and 14 years of experience (while the mandatory experience is 15 years). We had also raised issues of poor quality of infrastructure, the problems that students and teachers face with the credit based system that has been imposed on them and several other issues to do with the quality of education that the University has been providing. As a result of all these, the rank of the Mumbai University among Asian Universities slid from 96 to below 150. Currently, I am under suspension for holding the press conference and “misguiding the media”. This is supposed to be a “breach of the code of conduct”. The copy of the code of conduct that I have, however, says nothing about publicly criticising the University as a member of a teachers-students’ organisation.